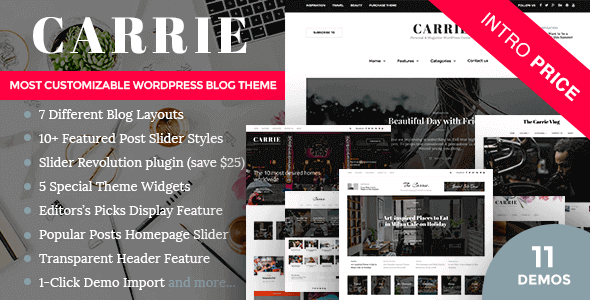 Carrie is a very stylish, elegant and powerful multipurpose WordPress theme perfect for any personal blog. Theme has an unique design with a lot of options, that can help customizing you journal, changing fonts, colors, layouts, post views and more. Carrie’s stunning sliders (Built-in Slider and Slider Revolution included) and creative promo boxes offer a unique visual experience to showcase your content in different ways with responsive layouts optimized for all devices. 1 Click Demo Data Importwith all demo data variations and demo pages from preview site with 11 demo data pre-configured websites ready to import with 1 click. Advanced Carrie Control Panel for easy theme configuration. 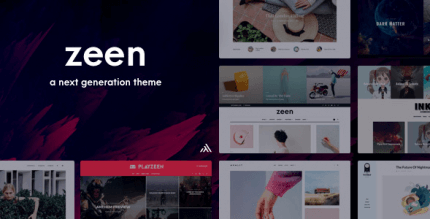 10 Theme Enhanced WordPress pluginsprovided with theme for free. Responsive layouts built on Bootstrap 3with retina support. Cross-Browser Compatible(Chrome / Firefox / IE / Edge / Safari / Opera). 3 menu positions with different styles(Top/Header/Footer) with option to turn off any menu. 10 Predefined color skins– create unlimited yourself. Unlimited Blog Stylesvariations and layout combinations. 3 Widgets Sidebarsareas (Left/Right/Footer Light). 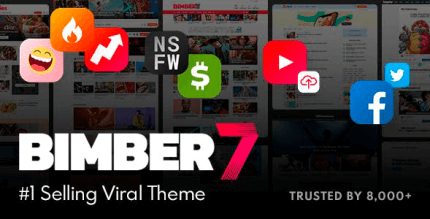 5 Custom Carrie Theme widgets(social share, recent posts, recent comments, posts slider, content widgets). Dedicated sidebars managementfor every page and post (Left/Right/Fullwidth). Footer HTML block with background image and any content. Post/Page Image Header feature (add custom header image for every post). Transparent Post/Page Image Header feature. Paper Page effect feature for posts/pages. Disable featured image on single blog post (separately or for all posts). Editor’s Picks Block on homepage with selected posts and different layout variations. Popular Block Slider on homepage with most viewed posts and different setting. Welcome Blockswith different layout variations. Special Offcanvas menu (accesable from header button, float animated from right). Lightbox and Lightbox Galleryintegration for any images in your posts. Post Formats support(Gallery, Video, Audio, Quote, Link, Status).